Most holidays had several things in common when I was a little girl: lots of company, extra church time, presents, and no school. We had little holidays like Memorial Day, those were more like snow days for spring time, just a parade, no company, no special food and no extra cleaning, and no church either. Thanksgiving was different: no church, no presents. 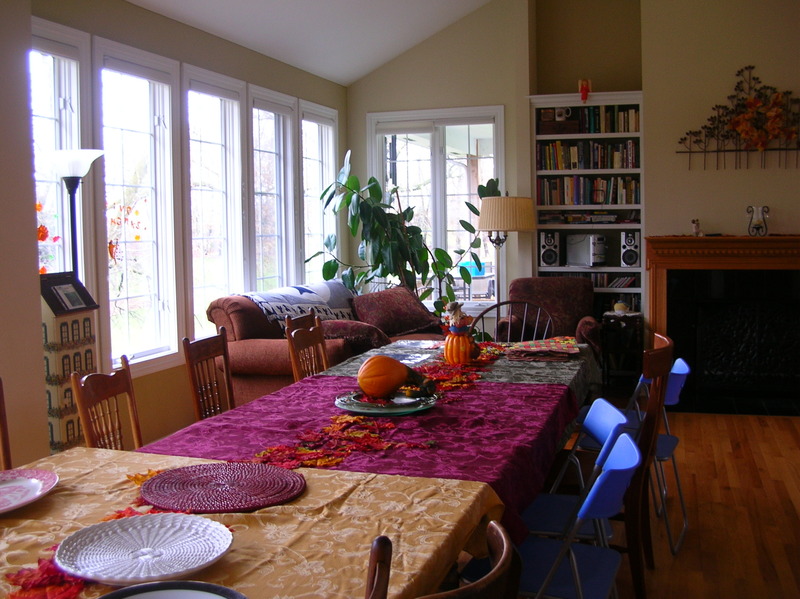 Of course if there was a holiday and company over, that meant lots and lots of extra cleaning and cooking. I had tons of work to do before the fun began. First there was all kinds of cleaning. That’s the way it always was with holidays; that’s the first clue I had that a celebration’s coming. Clean, clean, clean. Deep down clean: mop and wax the linoleum, vacuum under the furniture, starch the curtains with those darned prickly curtain stretchers, iron all the clothes, and end with closing up the ironer and tucking it away so it almost looked like a piece of furniture. Then I knew it was almost time for the company to arrive. That, and getting all dressed up in a pretty starched dress with the bow tied in the back. Put Mom’s breadboard on the table with the edge sticking out. That’s where she screwed a meat grinder down tight so it stayed put. I got a Little Kid to sit on top the board. That’s easy ’cause it’s the only time somebody sat on the table; any other time, Mom said, “Get the heck off the table. What were you thinking?” which was one of those questions that I was not supposed to answer, ’cause, if I was thinking, I would know better. Now grind up a bags of cranberries and one orange for each bag of cranberries. The whole orange, peel and all. Don’t taste any of this stuff, ’cause it bitter as all get-out and the taste will stay in the back of your throat all day and all night and even brushing your teeth won’t fix it, it’ll just make the toothpaste taste bad. I liked this part ’cause of the popping and gurgling sounds the grinding makes, and I liked the way all those tinsy tiny pieces looked when it came out of the grinder: all the different shades of red and orange, just like the variagated yarn Mom used to make mittens. Oh, I forgot to tell you to put a big bowl under the out-end of the meat-grinder; then again, any ninny knows that. Okay, now get some red jello, any kind will work, like cherry or strawberry, but not the kind with banana flavoring, that stuff is gross, never make that; if you want banana flavor, put real bananas in, those are good, but no bananas go in the cranberries, so just forget about bananas for now; save that for summertime when bananas are always 10¢ a pound. 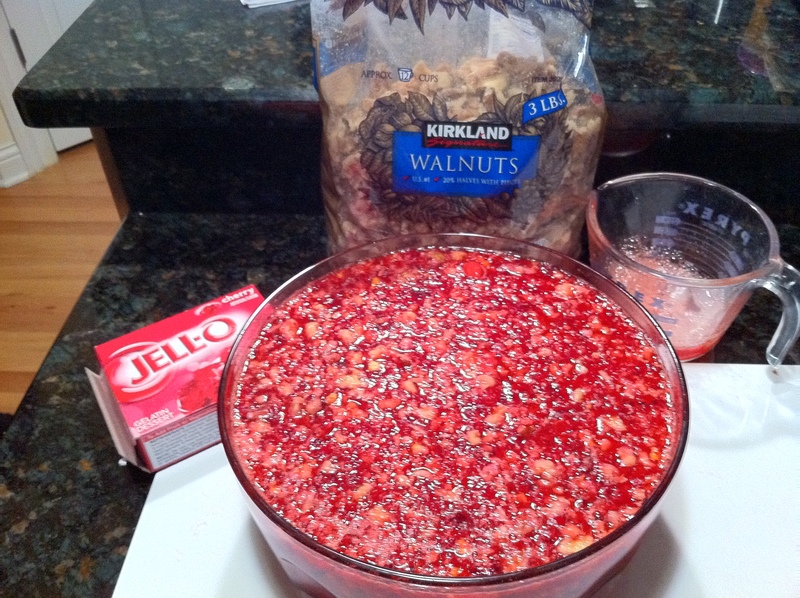 Use one box of jello for each bag of cranberries. Put in some sugar, too, ’cause those cranberries are super-bitter. Boil some water and mix in the amount like it says on the package. Make sure the water is boiling, that’s really important or the whole thing will be spoiled. If it’s not wiggly, then Mom got mad, ’cause food got wasted and so did time and money. Those were important things not to waste. Stir in a figure eight until everything is dissolved, then stir some more, just in case. Throw in a bunch of ice cubes and keep stirring. Just keep throwing more in until they stop melting and the jello gets all jiggly. Now take the unmelted ice cubes out. I liked to eat those and give some to the Little Kid as a reward for helping. Yuuum-mee. Next throw in the ground up oranges and cranberries and handfuls of chopped up English walnuts. Never put the nuts through the grinder. Even though that seemed like a genius of a time-saver; they got all mushy-mealy instead of crunchy. Don’t use the Black walnuts either, those are just for cookies and date nut bread or banana bread. The last thing: put the bowl in the refrigerator overnight. Oh, I forgot to tell you, cranberry relish had to be made a least one day ahead; you can do it a couple, maybe three days ahead if you want. If you forget that part, the cranberries will be ready the day after Thanksgiving. Never, never get the cranberries in the can. I doubted that stuff was even really cranberries. I had to eat it at a friend’s house once ’cause I said I L-O-V-E, loved cranberries, then that stuff out of a can came jiggling to the table, and I was stuck eating it just to be polite. Yuck-o, times ten. One last thing, don’t try to take a short cut and mix the jello and boiling water in your best fancy lead-glass bowl. It will crack clean around, and jello will seep out slowly so jello juice is all over the counter and dripping down onto the floor. I just did that, and only noticed when the level seemed way too low. That’s a waste of food and a waste of time and money. Something I still don’t want to do. Anyways, the do-over looks great! Just like a mini-miracle. I wish I would have had this recipe yesterday! I would have loved to make one of your family favorites, and it sounds delicious! I don’t have a meat grinder, do you think a food processor might work instead? I think a food processor would work, if it chops things up fine. I don’t have a food processor, so I’m unsure. I have seen one in action, so my guess is YES. Oh my, perhaps we should exchange recipes. By the way, Mom said she always uses lemon jello. I like raspberry best.